Gokulam Kerala FC beat Minerva Punjab FC 1-0 in another gaint killing. 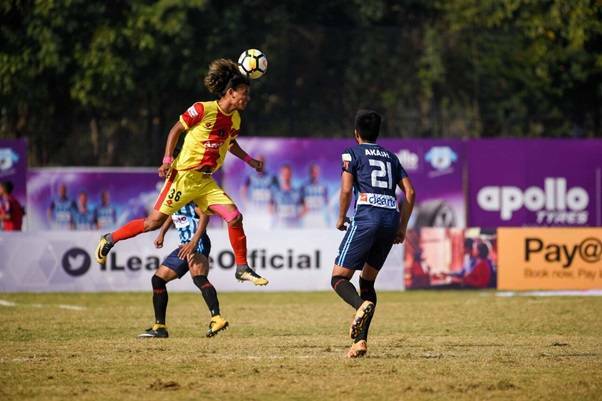 The race to Hero I-League spiced up as Minerva Punjab FC had a major slip after they lost 1-0 to Gokulam Kerala FC who have made a name for themselves as Minerva FC succumbed to be Gokulam’s third major victim after beating Mohun Bagan and East Bengal. First-half saw odd chances at both ends as both teams jostled to gain control over the game. The game was quite physical at times and none of the teams was successful to keep long possession or string passes together for any build up to the goal as odd chances were not capitalized. The second half saw both teams coming out to look for the elusive goal as chances opened up at both ends. Arjun Jayaraj fired in the first warning as he tested Minerva keeper Kiran Limbu with a powerful volley on the 66th minute as it crashed on the woodwork. It was Rashid’s turn on the 71st minute as the Gokulam midfielder dispossessed William Opoku for a delightful chip from 30 yards out, as Minerva keeper Kiran caught off the line, only to see his Gokulam Kerala’s effort finally paid off on 75th minute as Provat Lakra’s left-footed cross inside the box found Henry Kissekka whose initial header crashed onto the horizontal bar but the striker was smart enough to react to the rebound with a fantastic overhead kick to give Kerala a 1-0 lead. William Opoku had a golden chance to equalize on the 89th minute as he found space inside the box to strike a first-time volley but failed to hit the target as he sprayed his shot wide off the keeper. There were a few nervy moments for Gokulam as Minerva goalkeeper came forward in the final minutes and his looping header missed the target narrowly in the 96th minute. Gokulam managed to hold onto the lead and pulled off an incredible victory over league leaders Minerva Punjab FC to throw unforeseen possibilities into the title race as East Bengal and NEROCA FC still stays in the hunt.